Gents Piaget Classic Diamond Covered Watch with app. 25 carats with brilliant white platinum plating over 18k yellow gold watch can return to yellow or left as is in white.....Your Choice!!!!!. Quartz. Ref 7131 c 626. Fine Pre-owned Piaget Watch. Certified preowned Piaget Classic 7131 c 626 watch is made out of yellow gold on a Gold Link band with a 18k Two Piece buckle. 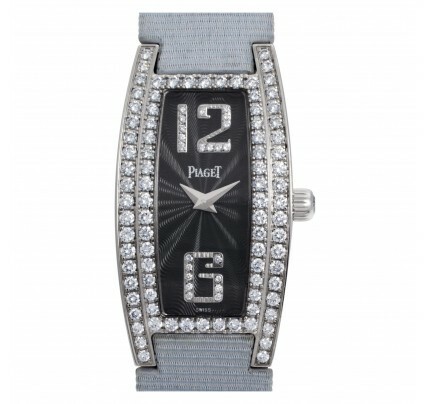 This Piaget watch has a Square caseback and White Diamond dial. It is Gray and Sons Certified Authentic and comes backed by our 12-month warranty. Each watch is inspected by our certified in-house Swiss-trained watchmakers before shipment including final servicing, cleaning, and polishing. If you have inquiries about this Piaget Classic watch please call us toll free at 800-705-1112 and be sure to reference W516278.